Tableau Friction: Um, where's this workbook? The need: workbook organization and management. The problem: Tableau offers very little in the way of help, and even provides bad information. During the course of a typical day I work with many workbooks – as of this writing there are 932 TWBs and TWBXs in 106 folders in my working file system. Some of them are my clients', some are my own, some are Tableau samples, and the rest come from places I've forgotten about. Keeping them organized, each in its appropriate folder, is difficult. Looking for one I'm interested in can be a chore when I can't recall just where it lives. I'm accustomed to applications that track the files I'm working on. They keep track of where the file was loaded from, and are happy to let me know, usually via the "File | Save As" option, or an equivalent. Tableau Desktop, on the other hand, doesn't provide this information. In many, many cases, once you open a Workbook and try to find out where Tableau loaded it from, you're out of luck—Tableau won't reliably show you this information (unless you know where to look). What's worse, Tableau will lie to you, showing you a location from whence the Workbook did NOT come. This is extremely frustrating, particularly when one's working with a number of workbooks simultaneously and needs to keep track where each of them came from. 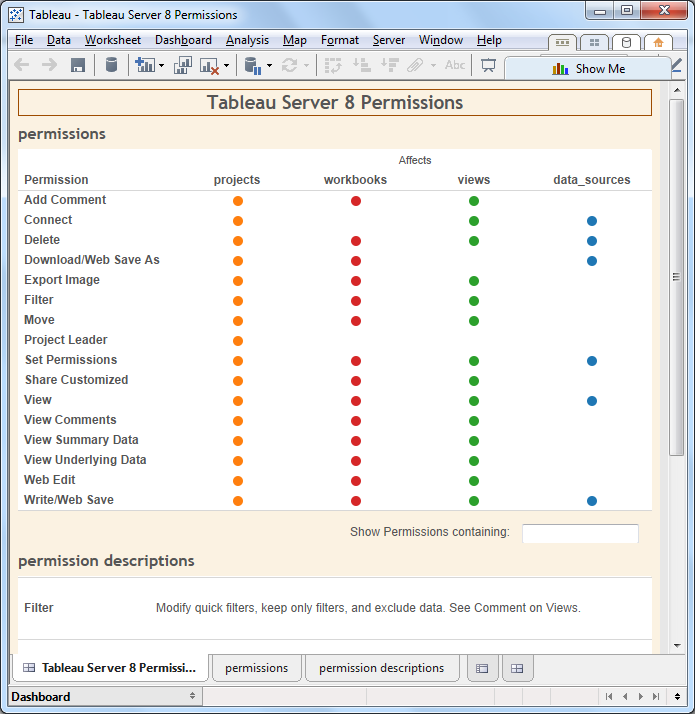 I open "C:\tech\Tableau\Tableau Server\Tableau Server 8\Tableau Server 8 Permissions.twbx"
Well, that's clearly not right. 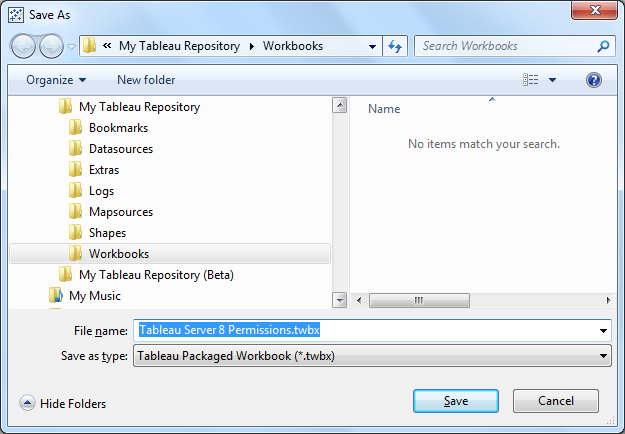 I certainly didn't pick up the Workbook from the Tableau Repository. 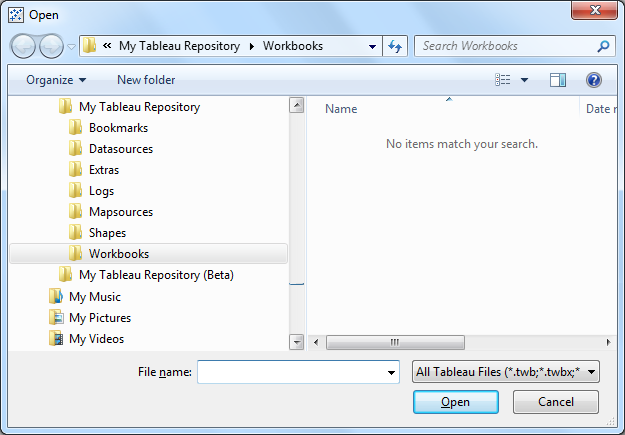 Tableau has once again shown me the Tableau Repository, and it's still not this Workbook's home. Why doesn't Tableau follow the standard convention and track the home directory of the Workbook it's currently holding? There's a very good reason for this—being—the convention, and I cannot think of a rational explanation for Tableau's idiosyncratic behavior. There are times when it's good to break from convention – Tableau is at its core a departure from the once-standard approach to data analysis (although not as radical and absolutely innovative a departure as commonly thought). This isn't one of those times. Tableau's default behavior should be to track the home location of every file it accesses and offer that location up to the user when asked. There are some circumstance when the user might wish for Tableau to behave differently, e.g. when consolidating a bunch of Workbooks into a common location. This could be accomplished by providing a mechanism for establishing a "default" location that could be invoked by the user when desired. 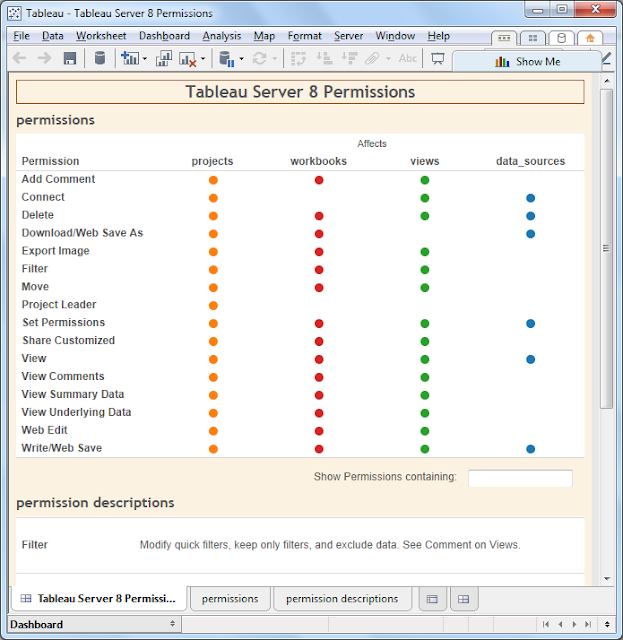 But that's an edge case, should not be the out-of-the-box default behavior—and it opens the door for all of the Tableau configurations that the community has been clamoring for, because once a mechanism is in place for configuring one option it;s available for configuring others. I know that hovering on the file's icon in the home page will show me a tooltip with the file's home directory in it. And this is in itself a good thing. But it's one of those side effect situations where one needs to take advantage of an auxiliary feature to get something that should be front and center. Tableau is full of things like this, each of them adding its own little bit of friction. Even the home page's tooltip is much less functional than it should be. You can't copy its contents, which would be really handy, and it doesn't show anything about the file other than its directory and name.